Condensing Ejectors are equipments which adopts improved method for filling volatile fluids such as liquified hydrocarbons (especially, LPG) in the closed container or tanksso that they can either be stored or transported. When a volatile liquid such as LPG is admitted in a closed container the space available for vapor already present (usually air) and vapor of the volatile liquid formed due to evaporation will be getting reduced progressively as the liquid starts filling up. This results in compression of the vapor and increases the pressure of the vapor beyond the vapor pressure of the liquid. Many alternative methods were proposed to avoid this rise in pressure such as permitting the vapor to escape. But this method cannot be applied in case of vapors being combustible or toxic or valuable. Use of ejectors which are also called as eductors proved to be a solution for the above problems. 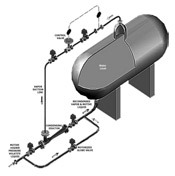 Condensing Ejectors are usually installed in the liquid supply conduit, preferably downstream from the liquid meter (as shown in the fig) if provided and generally located close to the liquid receiving vessel. The suction side of the ejector is connected to the vapor space of the container / cylinder to be filled. 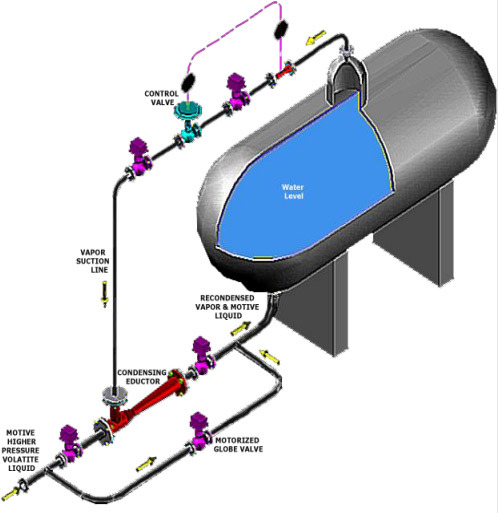 The volatile liquid is supplied from a source outside of the container at a suitable pressure using a liquid pump or from an elevated or pressurized reservoir as a moving column of liquid. Volatile liquid from the reservoir will flow at a substantial velocity from the nozzle causing a reduced pressure (Vaccum) in the chamber wherein the vapors produced by partial vaporisation of the volatile liquid are drawn into the low pressure zone of the eductor. These vapors gets intimately mixed with the moving column of liquid therewith causing complete direct heat exchange which results in effective condensation of the vapor into the liquid stream. The resulting mixture is then introduced into the Storage container / cylinder. Condensing Ejector which is activated by the fresh volatile liquid supplied not only draws in vapor from the vapor space of the storage container / cylinder but also brings about an intimate contact between the vapor and the liquid so that the vapor condenses / dissolves in the liquid and temperature remains uniform through all parts of the liquid mass within the Storage container / cylinder. Condensing Ejectors are used for transportation and filling closed containers with volatile liquids such as liquified hydrocarbons of which propane and butane are examples and other liquified materials of which anhydrous ammonia, vinyl chloride and sulphur dioxide are examples. With the help of these ejectors, LPG and LNG are filled in the cylinders.